Raschera cheese is produced in the mountains of the Monregalese area and bears the name of the mountain pasture at the foot of Monte Mongioie. The texture is elastic with small irregular holes dotted though out the cheese. It is produced and matured without the use of preservatives. Raschera is a creamy delicate, sweet, nutty and slightly spicy with salty undertones, similar to in style to muenster type cheeses. It is excellent for any cheese board, melted in rissottos or over vegetables or diced in salads. We have used it for pizza and as replacement for mozzarella. Pairs well with red wines from the Piemonte area like Dolcetto d’Alba, Dolcetto di Dogliani – Barbera d’Alba, Verduno Pelaverga. Finely chop the onions and brown in the butter, allow to soften. Separately beat the eggs in a bowl, add lukewarm milk and cream beating eggs as milk is added. Stir in parmigian and 2 ounces of Raschera the herb mix, salt and pepper to taste a pinch of nutmeg. When this has all been mixed well add onion and mix. Pour this mixture into greased and floured moulds. Bake at 300 in a bain marie for about 40 minutes. Melt remaining Raschera in 2 glasses of milk in a bain marie. To Serve line bottom of dish with a ladle of fondue, top with Tartra and cover with melted cheese. Raschera Cheese . All about it. Translated from Italian with Google Translate. Not the most accurate, but the best I could do. Raschera is a delicious cheese from Piemonte with Protected Designation of Origin (PDO ), which, due to its characteristics, it is greatly appreciated not only as a product table but also as an ingredient in cooking. In this guide we will discover the history, characteristics , production methods , and recommendations for the consumption of Raschera PDO dairy product obtained only with milk from the ancient tradition of the highest quality. Raschera is a raw and semi-hard cheese that comes from the mountains of Piedmont and, more specifically , from the Valleys Monregalesi which are in the province of Cuneo. In these mountainous areas belonging to the Maritime Alps for centuries the economy revolves around the breeding of dairy cattle , but also goats and sheep, who will find large tracts of mountain pastures . Raschera PDO is produced from cow’s milk , which you can add the milk goat and / or sheep in order to get a more pronounced cheese flavor , slightly spicy. The name of this cheese, Raschera , derived from a local name that refers to a pasture and a lake situated on the slopes of Mount Mongioie , which, with its top touching 2630 meters of altitude. The area of the so-called ” Alpe Raschera ” is the cradle of a very special cheese production , following a centuries-old tradition , produces cheese round and square . In particular, the latter type of cheese that appeared more comfortable to carry the Alpine pastures to the valley floor , where the products of the mountain all still traveled by mule . Here then the square shape , making it more practical to stack and carry, it still remained a key feature of cheese Raschera . Currently , with the disappearance of these logistical problems , we produce both square and round shapes ; machining initial milk are the same , then with a procedure that differs for the use of molds of different shape. Currently it is estimated that only less than 3% of the forms of Raschera are produced nowadays in the cylindrical version . The downstream transport of the forms did not occur , however, before they had spent a certain period of maturation within particular premises such saddles. These cells maturing , very simple but functional , were and still are derived from a simple digging in the ground. Inside the seats creates an ideal environment for the maturation of cheese, with constant temperature and moisture content . In these rooms there are also particular strains of mold that settle naturally on the rind of the cheese , giving it its characteristic pink hue . Currently only a limited part of the production of PDO Raschera still takes advantage of these traditional shelters . Today, as then , Raschera is manufactured using high quality milk produced by cattle fed only hay and fodder in the mountains. Especially during the summer months , when the meadows are full of the typical species of high altitude , the cheese takes on even more fragrant aromas and flavors . In recognition of the excellent quality of the product and the long history that sets it apart , the European Union has assigned to the cheese Raschera the PDO ( Protected Designation of Origin ) in 1996. 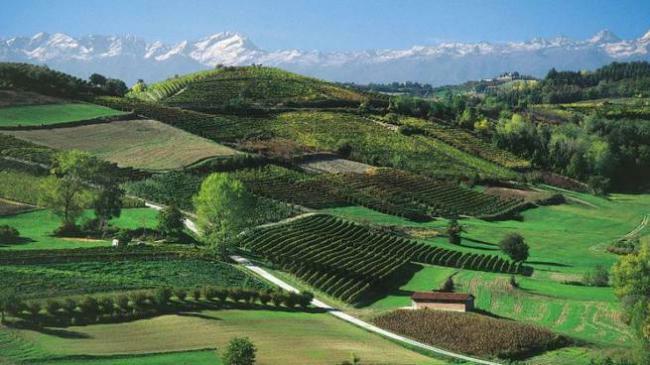 For the protection of this denomination there is the Cheese Consortium Raschera PDO ( see link at bottom of page ), which brings together producers and maturers and is responsible for the development , oversight, and promoting this typical Piedmontese cheese . The Cattle , sheep and / or goats whose milk is used for the production of PDO Raschera is powered exclusively by natural forage , both fresh and preserved , which come from the pastures of the production area . When machining is used in dairies milk from two milkings , one of the evening added with that of the morning , and production takes place throughout the year . The milk is heated in large containers until reaching a temperature between 27 and 36 ° C , and the addition of liquid rennet of animal origin that determines the coagulation of milk . Usually you have to wait twenty minutes for the entire mass abundant coagulation is complete : at this point occurred the separation of curds and whey , which is the water fraction of the milk in the local dialect is called prod. After which the breaking of the curd , which is made using a particular traditional instrument that takes the name of spanuira . The whole mass is subjected to whisk for the next few minutes , an operation that is performed with the sbatarela , a thorn in spruce wood obtained from the top of the tree . The curd is collected by special rotational and placed inside a canvas made ​​of hemp ( the curuira ) in order to allow it to drain. After a rest period of about ten minutes , the curd is still wrapped in this cloth is placed inside cylindrical containers , the fascele , made ​​of wood and provided with holes . Above each fascela is placed a weight, which will be left in position for a quarter of an hour approximately . The forms are subjected to these pressing operations which allow the separation of the serum possibly remained in the dough and gives the cheese its typical flattened shape . Subsequently, the weight is removed by opening the fascela and working the curd with hands , up to reduce it into small fragments . It then repeats the previous step , with the collection of curds in the cloth of hemp and its distribution inside the molds that will give the final shape , cylindrical , square , or more likely . The salting of the forms is dry in two separate occasions, and possibly it is possible to precede all from a prior salting in brine . The salting starts from the top side of the form , which is sprinkled with coarse salt and left to rest for about 24 hours . The form is then reversed and salt on the other side and along the edges. After the salting phase forms have absorbed the right amount of salt that will be distributed throughout the mass gradually during ripening. The curing stage takes place within particular local , in the case of D’ Raschera Alpeggio PDO , are represented by the traditional saddles dug in the ground and described previously . If the dairy was in the plains , the premises used for seasoning reproduce faithfully temperature and humidity typical of saddles mountain . The forms are set to mature on wooden boards and are periodically turned over and brushed to remove dirt deposits have accumulated. According to the Production Regulations seasoning should be continued for at least a month, but especially the artisan producers leave to mature forms for several months, until five or six. In this way, the cheese will be a fresh and delicate taste to a much more intense and flavorful . Immediately before being marketed each form that meets the quality standards required by the Regulations is marked with a flag to the fire that will make it so unique . Raschera PDO cheese is a semi-fat or fat characterized by a flattened shape , both round and square . As regards the dimensions and weights , square shapes have sides of about 28-40 cm in length, for one barefoot ( or thickness ) of about 7-15 cm and the weight of each form is variable between 6 and 10 kilograms . The round shapes instead are characterized by a diameter of approximately 30-40 cm and by a heel of 6-9 cm , of slightly convex shape . In this case the weight of the forms is around 5-9 kilograms. Seen from the outside , Raschera PDO comes with a thin crust , smooth and regular texture quite elastic. The color of the crust is usually gray tending to pink -brown, sometimes with greenish and yellowish pink on bare patches , which are usually accentuated with the progress of aging. It is important to remind the consumer that the rind of this cheese , for health and hygiene reasons , it is not edible . The dough is raw and semi-hard , compact consistency and somewhat elastic , and can be observed within the same holes (ie the ” little holes ” typical of cheese that are formed during the aging process ) fine , irregular and scattered . The color of the cheese is typically milky white, depending on the season and can take shade ivory white tending to straw . Tasting Raschera PDO ” cool ” is recognized because of its mild flavor , delicate and fragrant, strongly reminiscent of that of raw milk. With the progress of the ripening flavor is enhanced by a slightly spicy nuance and becomes more intense and full- bodied . The prohibition of the use of any type of preservative, both during production and during aging , gives the DOP Raschera the characteristics of a dairy product is completely natural, healthy and genuine. Here is the nutritional table on 100 grams of cheese Raschera PDO . Raschera PDO cheese is a nutrient that in 100 grams contains about 30 grams of fat and more than 20 g of protein. It is therefore a product to be consumed with some restraint on the part of those on a diet or overweight, since in 100 g of cheese contains about 340 kcal . Raschera is however a less caloric than other cheeses , and especially those of hard cheese . Please also note that those who suffer from high blood pressure should consume small portions because of the high content of sodium chloride. Thanks to its excellent nutritional properties Raschera PDO cheese is ideal for children and adults , sports or otherwise, and for the elderly . In the latter case, the soft texture and flavor invogliante are able to stimulate even the most inappetent . The high quantity of mineral salts , especially calcium , is an invaluable aid to children in the growth phase and for people predisposed to osteoporosis. In addition, each form has a branding exactly in the center of one of the two flat faces . Mark on the paper shows the logo of this PDO cheese , consisting of a letter “r” stylized green that goes inside a small “a” in the case of cheese Raschera ” Mention of Alp ” (see below ) . Without a doubt , Raschera is a great semi-hard cheese that is eaten as it is, perhaps accompanying it with a slice of crusty bread and a glass of good red wine from Piedmont . Raschera DOP is also a particularly versatile in the kitchen, and can be used for the realization of different recipes as appetizers, first and second courses. For example, this cheese is particularly suitable to be melted , so it can be used for the preparation of tasty and creamy risotto with bacon , bacon , zucchini , leeks or whatever your imagination suggests . Raschera is also good to be eaten with a side dish of cooked vegetables or diced in salads , which gives a flavor really tasty . Raschera is often also used to prepare delicious fondues , vol -au-vents , quiches, pasta and as a dressing for potato gnocchi . The Mountain Community of the Valleys monregalesi , includes within its territory one of the largest complexes pasture in the Province of Cuneo. In this part of the Maritime Alps , which is due at the end of the chain, the peaks reach modest altitudes and pads have a sweeter morphology : the mountain pastures so come to greater heights . These surfaces are still intensively used in the summer by the herds of cattle , and sheep graze the poorest areas and high . As always, these Monregalese Alps , cheese is a particular product that has the name of a lake and a grassland site at the foot of Mount Mongioie ( m.2.630 ) : cheese RASCHERA . Historically we have the first hints of the existence of this cheese into a lease at the end of 1400 found in the municipal Pamparato , in which the local lord demanded by the shepherds who ” beat around their cows to graze the grass of the Raschera lawn ” for the payment of some forms of” the good cheese that gets up there . ” In the early ’70s , due to problems of market and consequently the depletion of the labor force that juvenile mountain areas were suffering due to the pro- industrial policy then prevailing in Italy , it is in danger of permanently losing this jewel of dairy production and craft . A curious initiative of some characters of Fabrosa Soprana ( the heart of the summer production of Raschera ) , always in love with the local tradition and of the genuine products and linked to the peasant culture of the mountain , he allowed what was said before it did not. Not only that, but there was , at the level of production, a turnaround with a net increase in the market of Raschera Alpeggio . They formed the ” Brotherhood of Raschera and Brus ” ( another typical local dairy product ), whose ” Knights ” had and have the task to ” propagate , raise awareness and support ” the production , consumption , knowledge and sales ” Raschera ” (following the mountain tradition , locally , is also used in the Italian female to indicate this cheese). This was the first act of a big political movement and a technical note not to forget this cheese. In the early 80’s in fact , the Chamber of Commerce , Industry, Handicraft and Agriculture of Cuneo and the Mountain Community of the Valleys Monregalesi , presented the study and all the necessary paperwork to the then Ministry of Agriculture and Forestry aimed at recognition of the DO ( Designation of Origin ) cheese Raschera . Being characteristic of the cheese DO ” RASCHERA ” the ability to be manufactured either in the form ” round “, or cylindrical , weighing approximately 5-8 kg , with a barefoot 7-9 cm . and a diameter of 35-40 cm . and / or in the form ” square “, or rectangular , of a weight of about 7-10 kg , with a barefoot 12-15 cm . and a side of 40 cm. , it is obvious that also the processing will undergo , after a start perfectly equal , a diversification to obtain the product in the final desired shape . Therefore, the first part of the work will consist of the following stages: cow’s milk (which sometimes is added goat’s milk or sheep to make the taste of the cheese derived spicier ) , from two milkings ( the evening one more than the morning ) , may be added in the amount considered optimal , liquid rennet , after heating the mass to a temperature of 27-30 degrees centigrade. During heating, you must take care to continuously stir the milk and keep it stirred so that the heat is better distributed within the mass itself. Reached the optimum temperature and added the liquid rennet , the product is left to rest for about 20 minutes , half an hour , keeping the vessel that contains it covered with a canvas cloth or wool adapted to prevent any dispersion of heat. Is obtained so that the curd is then broken with a spatula (called ” spanuira ” ) , secondly, for at least five minutes we proceed to whisk with a thorn wood characteristic shape of said ” sbatarela ” (derived from the manipulation of the tip of a fir ) and finally arranges for the collection of curds separate from the whey (called the “prod ” ) with slow circular movements. This curd , well separated from the whey is collected in a canvas called ” curuira ” from which it can drain , and after about ten minutes , all the while wrapped in the cloth , is put into wooden forms cylindrical with a diameter of 35 – 40 cm. ( the so-called ” fascele ” ) having holes in the board acts to the passage of any serum still present and then loaded with weights to facilitate bleeding . After about ten minutes, open the ” fascele ” and the curd is kneaded with the hands sminuzzandola finely ; After that , harvest the product again in the ” curuira ” and later in ” fascela ” , puts weight below where you will stay for at least 12 hours . Hence it is removed as a finished product , ready for salting and seasoning . Salting , as a rule , is carried out first on the top face of the form as soon as removed from the press and with coarse salt for about 24 hours , and thereafter turned the form, for a day or two, on the other side and always bare and dry with coarse salt. * If you are in pasture , the place of seasoning called ” saddle ” consists of a restaurant is housed in the ground, the roof of which is nothing more than a small vault in turn covered with earth , precisely for these its characteristics, allows a constant temperature equal to the average of that year ( as happens in natural caves ) and , very importantly , determines a constant humidity and optimal for the complete maturation of the cheese and for the development of molds red characteristics on the crust of the same . * If you are in the company of the valley or plain , the place is nothing but a maturing cellar reproducing as closely as possible, the characteristics of temperature and humidity before mentioned for the ” saddles ” . In both local cheese ripening will be laid on wooden boards and cleaned and brushed on the crust that gradually take over the texture, color and smell typical of seasoned cheese RASCHERA . The minimum ripening period is required by the specification of a month , but the tradition also includes cheeses aged for five or six months who purchase a savory taste that will be especially appreciated by ” strong palates .” The various processes described above , lead to having a cheese round shape. Below we will look at the process that will lead to the final result as a square shape (ie rectangular ) : cow’s milk , with the addition of goat’s milk and / or sheep in limited quantities from two milkings , is heated until it reaches 27-30 degrees Celsius ; then adding the right amount of rennet which must always be liquid . After about an hour the curd is broken with a spatula ( spanuria ) for five minutes and then we proceed to whisk with a skimmer ( sbatarela ) and finally arranges for the collection of the curd (prod ) with a slow circular motion. The curd is so separated from the whey is collected in a canvas ( curuira ) from which it can drain , after which , always wrapped in cloth and placed into cylindrical shape with a diameter of 35-40 cm . ( fascele ) having holes on the board. After about ten minutes they open the ” fascele ” and riimpasta the curds with your hands sminuzzandola finely. salting is carried out with dry salt on all four sides of the heel during compression that still requires the overturning of daily form ; salting of the two flat faces is done only after removal from the ” basin ” . A salting completed , this cheese that has already assumed a square form , it is sent to the seasoning on the premises that , as mentioned before about the seasoning for the round shapes , can be , depending on the area in which it operates , the ” saddle ” dell’alpeggio or the cellar of the bottom of the valley or plain. Even in these cases , the minimum maturation period allowed by the specification, is one month . Generally the RASCHERA square is tastier than round . Especially in the summer and then the RASCHERA D ‘ ALPEGGIO is preferably manufactured in a square shape . Members only in the Dairy processors is prevailing in the manufacture of square shapes than round ones (over ninety percent of their production is square ) .